There are now 2 pedigree databases available. Both have slightly different information. This is wonderful when you are trying to do some research on the bloodlines of the Barbet (old and new). They both treat all Barbets, meaning both types. Using one of my pedigrees which I know is not "real" correct, but so do many and so are many...but that is beside the point.ALL breeders know that. 1. )Mine.From asking questions and rebuilding the pedigrees by crossing information. And with this tremedously erroneous information ( from all the changes back and forth), breeding committes which we don't know how competent they are are making decisions that will destroy the breed and placing their dogs/ production wherever possible and not letting people take their own decisions. That is scandalous. There is less information on the 1920's and 30's lines as I posess many of the original pedigrees and the others are at the SCC archives in Evreux, France. A pedigree is what is in your dog. It gives you information, if you have a photo available, on what mom and dad looked like. The breeder can tell you how mom and dad were and what their character was like, how tall they were, the coat they have and even the shape of their heads...because that is what the breeder’s role is. What one must know is that the information available on these databases is, as it says, not necessarily accurate. When "shopping" for a dog or a bloodline, it is vital to ask the breeder about what has gone into his/ her line. They obviously should know. It’s like knowing who your grandchildren are and doing a family tree. When you do that..(shame the Mormons in Salt Lake City, Utah can’t help us on that one...! ), you will learn to ask the right questions. Spend time looking at the databases, compare the information on both. You will learn some surprising things. The French "Titre Initial" or “T.I” or “ATI”, means the dog has no ancestry in most cases. That’s why their birthday is: 1/1/year. On the other hand, some dogs are TI, because the owners never registered the dogs. Why? Silly reasons, like perhaps they didn’t think it made any difference, because they knew what they were doing and a piece of paper didn’t make the dog any better. Ø	Like perhaps, they didn’t believe in giving some people in Paris money that they could use otherwise..like pay bills? That is even the case today as in France, dogs of a breed are supposed to be confirmed at age 1. They go in front of a judge and the judge says, “ Yes, your dog corresponds to the breed type, or no, it doesn’t”. So....lots of people buy a dog and don’t feel it necessary to do it. In France, I think the statistics are way less than half of the dogs never get confirmed or even go to a dog show. Those statistics exist, but right here that’s not my point. My point is, what you put into the dog will come out. As it says in the "Thesis on the European origins of shepherds" ( p. 77: “ Proof of heredity can reappear, after 150 years of a severe selection of dogs...”. this is obviously the case in any breed. A pedigree is a piece of paper...for what it’s worth. When the Barbet was re-incarnated in the 80’s, because it was said at the time, that the breed was extinct, it was re-incarnated with Barbet type dogs with no Barbet blood in them. Poodles and the likes/ mutts were used. Most of us know that the character of a Poodle is not the same as a Spanish water dog, or a Portuguese water dog or a German shepherd or an Airdale. The Barbet for whom a standard was written in 1891 was a Griffon...another family of dogs. Page 28 of the thesis, says a gundog is different from a retriever. Their behaviour is different. Does a Barbet hunt with his nose up or down? Does he even hunt (now)? Well, no Griffons were ever used to refabricate it...in the 1980’s. The pedigrees show ATI dogs who after 1 generation became “real” Barbets... 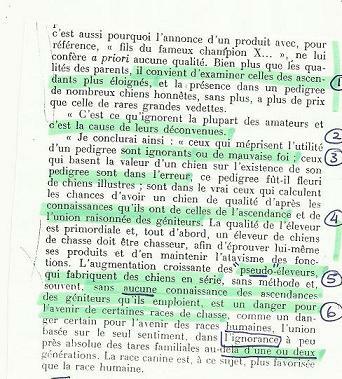 BUT:It takes 3 generations minimum to give you a real Mc Coy ( E. Gayot, Le chien 1865) of whatever breed you’re working to rebuild. And that’s if you keep re-dipping it “properly”! Lynx , a TI was a mutt found in a pound in Paris. He was mated with another mutt from another pound in Paris. He may have a lot of descendants, but are they his? Who can prouve that? There are no photos nor is there any evidence. Then as I mentionned earlier, some mutts went into a show got confirmed as phenotype of someone’s idea of what a Barbet was supposed to look like 300 years ago with no regards to the Standard. (Yes, that also can happen and still does) and this dog came out as a “Barbet”, most were poodles, one was a Portuguese water dog, and 1 Spanish water dog. There was an Irish water spaniel also used( which is not a problem to refresh blood and re-add Barbet on it). It has been known for several years as the Dutch speak freely about it.It only became known in France recently. Some try to breed to what was done before. Of course some people fought against what was going on at the time and that’s why there were 2 clubs for a few years. There are 2 types of Barbet nowadays, the Grand Barbet refabricated from poodles, a portuguese water dog and mutts and the Barbet français which descends from the lines in the 1920's and still looks like the phenotype of 1886. One would say...”why did they do it?” One would answer,” dunno...because there were Barbets at the time with proven ancestry - phenotype and genotype- with photos to show how the lines came from the 1920’s.” However, these dogs were far from Paris and in the 1980’s, it was difficult to go south... Whereas some Scandinavians will travel 2 or 3 days for a mating, some French people refuse to drive 3? hours for a mating or to find a bloodline. So, pedigrees. pedigrees...It’s up to the breeder to set them straight? Well..yes. But that would be by showing the example and going back to 1980. Who mated who with whom and who was in charge? . It would appear logical it should be when Lynx and Serinoire were used in lieu of any Barbets. As far as any pedigrees from the original bloodlines I have the proof from the “old” breeders. Those are the bloodlines I have reconstructed with pedigrees and photos. And yes, some are wrong because the person in charge of the club refused to confirm the original bloodlines and once in a while one managed to get through. So, people were forced to lie. The SCC (French Kennel Club) knew there were major problems, because people kept filing complaints...but next to nothing happened because as it is usual in politics and with money involved, some people were protected. Documents were put at the bottom of the pile, until they were forgotten and that went on for 25+ years. Everyone knows this which is one of the reasons the history of the Barbet is “hushush”. Or has been, until recently. So in conclusion: yes, look at the pedigree databases and ask questions. Why is the pedigree on Internet if it is wrong? Good question! I’m not the webmaster. So I can’t answer that one. And no, this is no April 1st joke. It is not even funny. It’s real sad. DNA will hopefully be able to make things true, as opposed to a parallel underground database circulating for "oodle friends" only. It's main objective is to make people believe that they know the truth and that everyone else is lying....of course. It would appear to me that anyone setting up this major endeavour, would contact the breeders and ask them before posting wrong information on a website. Even out of sheer politeness,rather than arbitrarily do the work that the country who owns the pedigree should be doing, and obviously isn't. People who advertise these websites are contributing to the misinformation of the general public, with all the responsibilities it generates. The poodle pedigree databasebelow can tell you a lot about the ancestry of the poodles used into re-incarnating a barbet without any Barbet blood. When you select a pedigree on the Barbet database, select 7 or 8 generations and you will find a lot of them. You may not believe your eyes. So keep going back until you can digest the information. That's what I did. Latest news 9/07/09: the French club will be investing in the DNA tests so that pedigrees are modernized and show DNA and parents are listed. This information is mine and I am solely resposible for it as taken from official documents I possess. It would appear that now there may be color differences on the names if the pedigrees are incorrect. Of course, pedigrees that have already been printed with wrong information on them can be compared to actual pedigrees even if they are 50 different colors. Falsifying an officially registered pedigree on internet for everyone to look at, without the breeders' authorisation is against the law and completely useless.I have never authorized any of my pedigrees to appear on the databases, nor was anyone I know ever contacted for permission.All was done arbitrarily on a private website promoting oodles, and of course demoting Barbets with Barbet blood. Then, a poodle is a poodle regardless of the pedigree being right or wrong. This dog had not a drop of Barbet blood which to some appears useless, as long as the right name is on the label...what is this world coming to? How do we work for the future of an endangered breed when this is going on? 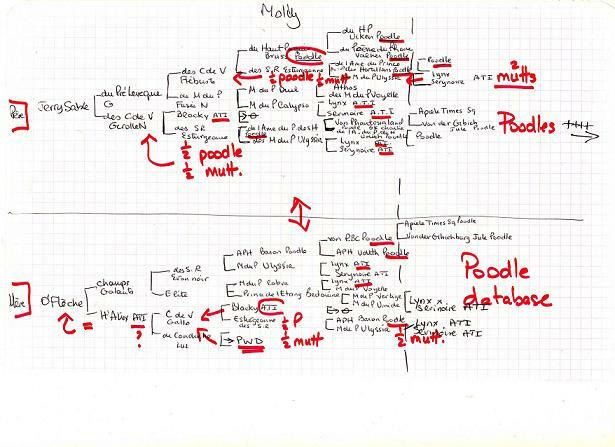 So here's my handwritten pedigree of a dog I had. They called her a Barbet and she was French Champion.I have more. I have said it and I will say it again: these websites should not be open to the GP if they really are to help potential breeders make choices when selecting.Of course, if they're not, that's a different story. Apparently, there are some problems on the PWD database. BUT I have already logged the info. It's not recent. So, of course the database below shows the "official" pedigree...however. Behind Taro are some crossing of shepherd breeds. There are shepherds other than the German one! And they pass on their colors, too! Taro os on a French database in Chiens de France, too. 2.many "amateur" breeders ignore a lot of info and have "problems"
5.The increase of "pseudo"-breeders having serie litters with no rhyme or reason with no knowledge of the breed and the pedigrees are a threat to a breed. So, that does not come from me. I have been fighting this tooth and nail and had a lot of people down my back, to be polite. The problem with the Barbet is just what is written above. Lots of real amateurs who are trying their best to mislead others and grand incompetence. Turning our rustic old breed into a overgroomed show dog that has nothing to do with what the breed has been, historically. I can hardly wait to see what happens next week in a northern country with the mating of the Pont Audemer. And, by the way that was never "approuved" by the SCC(they do not govern the FKC) or the club as it says on a particular site. Again, you must go back as far as possible when studying a pedigree. If half of the info is not correct and much of it is wrong, then what?